I finally made a stuffed sweet potato! I’ve made them for us for dinner time and time again but never made it for the blog. Obviously I am super happy to share with you something we eat for dinner! You can make these so many different ways, even with what’s just in the fridge and pantry. Normally I do add greens and beans, just in different combos. 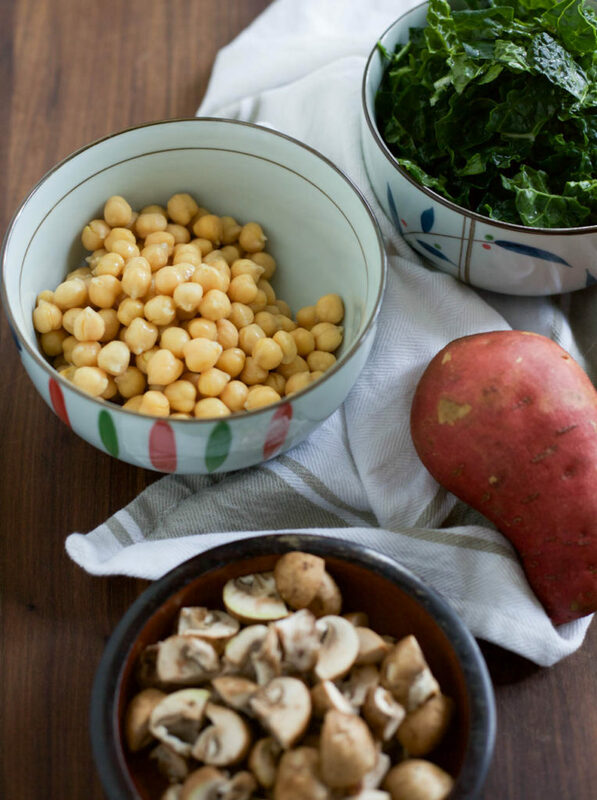 This one has my favorite kale, lacinato, tons of garlic, chickpeas, olive oil, white wine vinegar for much needed acidity, and small mushrooms. It makes this more of a meal, a totally perfect lunch and dinner. Honestly, this would be a fantastic, filling, and crazy healthy breakfast. Especially if you love savory breakfast foods! While this makes enough for two, I baked two extra sweet potatoes for leftovers :). Brian really liked this but for sure wanted roasted chicken, sausages, or some other side for a bit more. I love it with roasted chicken sausages, it’s the perfect small amount to go with these beautiful vegetables. Take a fork and poke sweet potato all over. 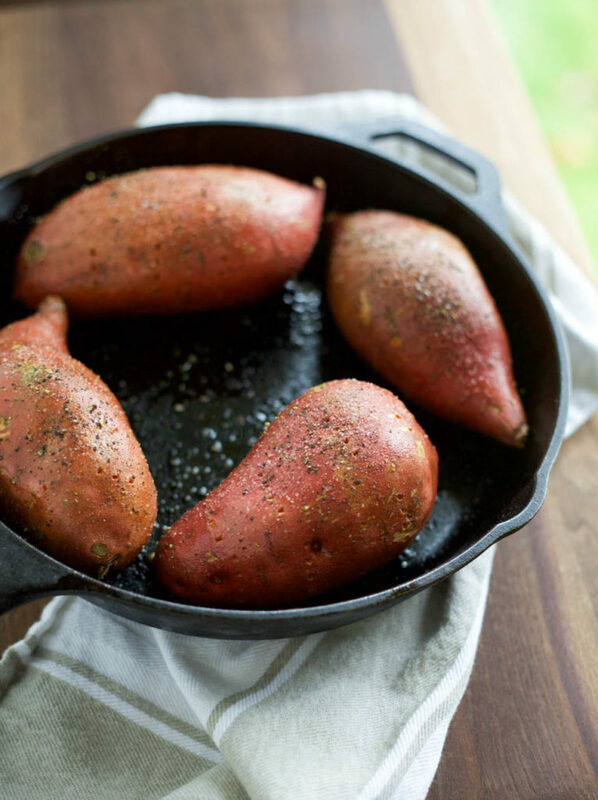 Place sweet potatoes in an oven safe dish. Rub with 1 tablespoon olive oil and sprinkle with a tiny pinch of salt and pepper. Place in oven and bake for 1 hour. 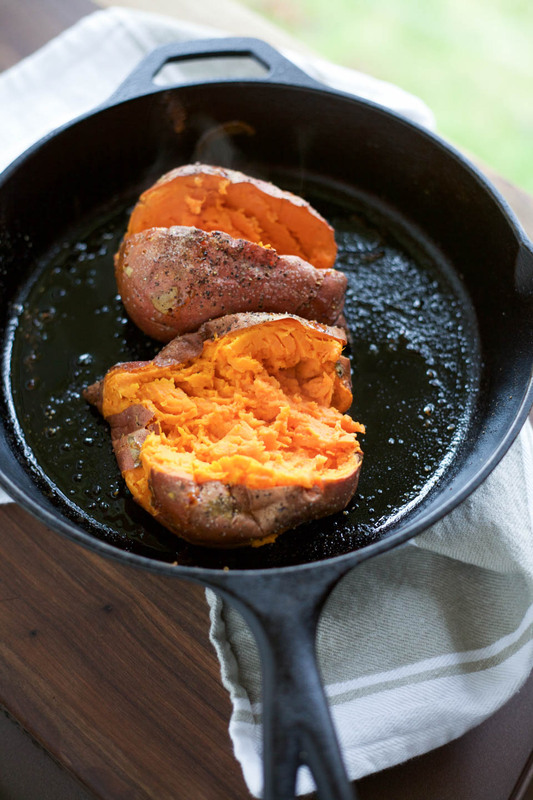 Remove sweet potato from oven, cover pan with foil to keep warm, then make filling. Place 2 tablespoons olive oil in a large skillet over medium heat. Once oil is shimmering, add garlic, stir and cook for 30 seconds. Add mushrooms, stir and cook for 1 minute. Add drained chickpeas, sprinkle with 1/8 teaspoon fine sea and pepper, stir to combine. Add kale and white wine vinegar, stir to combine and cook for 1 minute until kale is lightly wilted but still bright green. 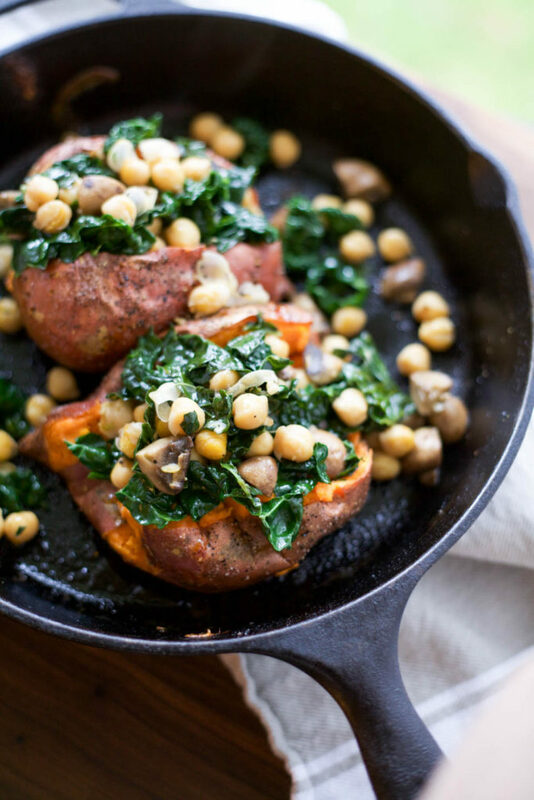 Slice the sweet potato down the center, use fork to mash inside, sprinkle with salt and pepper, add butter if you’d like, and top with the chickpea kale mixture. Season with salt and pepper if needed. Store leftovers in an airtight container for 1-2 days. Oh wow, these look amazing!!! 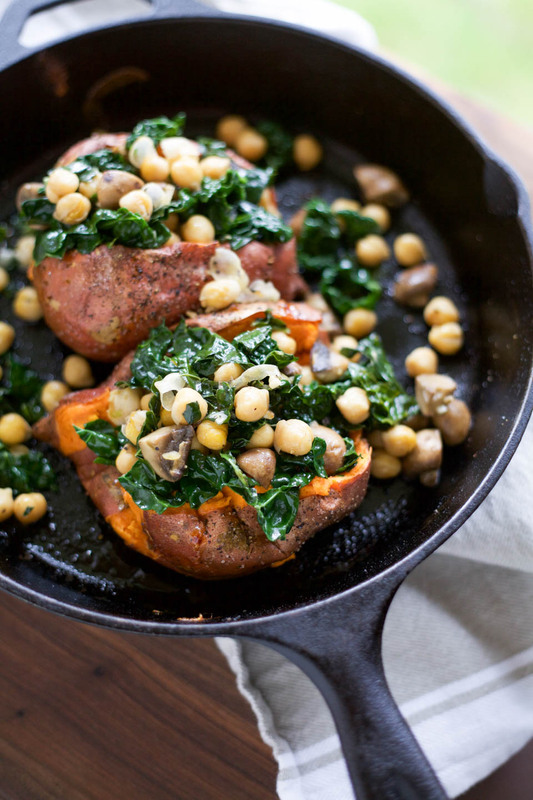 I love sweet potatoes so much and this looks like the perfect hearty dinner! Thank you so much, agreed! 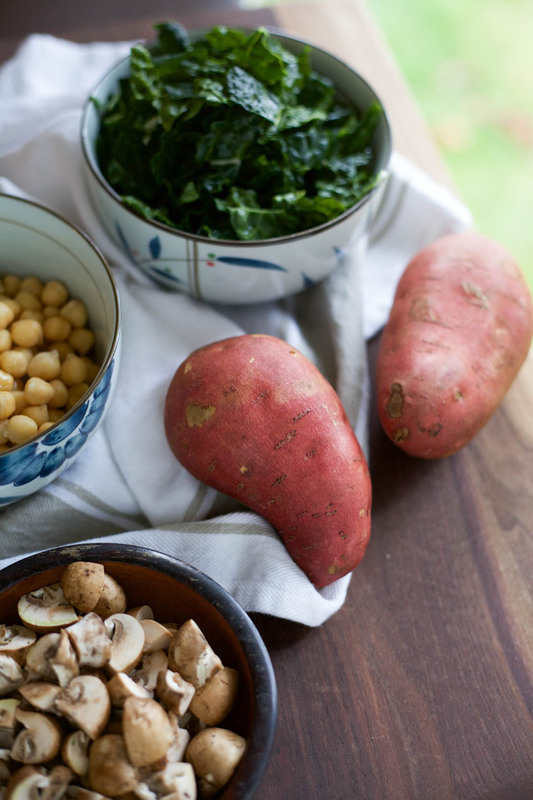 We are loving sweet potato anything around here. This looks amazing! This looks fantastic! Such a healthy and hearty meal. Pinning and hoping to try soon! This would be perfect for a light dinner or lunch! Love the flavors!